A library originally built 55 years ago at a small Colorado school has just had a $45 million renovation, turning it into what college officials are calling the largest carbon-neutral, net-zero energy academic library in the United States. The school accomplished that even as it more than doubled seating in the building and expanded it by 25,000 square feet. Colorado College's Tutt Library, which officially opens in mid-October, has been undergoing its makeover since May 2016 after a year of planning. The 94,000-square-foot facility now accommodates seating for 1,100 patrons, compared to the original 495. The institution has about 2,000 students. The new space includes data visualization and GIS labs, room for trying out 3D modeling, robotics and virtual reality and a classroom where instructors will be able to experiment with new forms of teaching technology. Other facilities there include academic support services, such as the Colket Center for Academic Excellence, the Quantitative Reasoning Center, the Writing Center, English as a Second Language, thesis support, the First-Year Experience Office, the Crown Faculty Center, and several research librarians – all on the same floor – to enable students and faculty to consult with professional staff in one location. The library also features terraces on each level, nearly 13,000 square feet of glass and a live green roof consisting of about 5,000 flowering plants. The carbon neutral, net-zero status of the library takes advantage of a new geothermal energy field, a 115-kilowatt rooftop solar array, a 400-kilowatt offsite solar array and a system that uses heat waste from industrial processes to provide heat and power. The geothermal field next to the library has a grid of 80 holes drilled 400 feet deep and five-and-a-half inches across to function as an exchange system to deliver heating and cooling to the library. The institution has decided not to pursue LEED certification for the building, according to reporting by the Colorado Springs Independent. 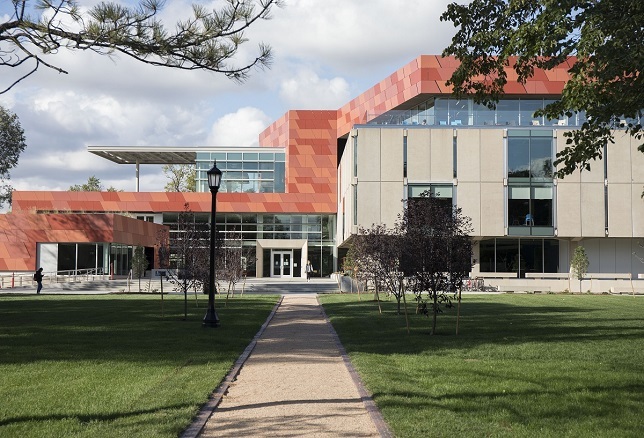 The newspaper quoted Sustainability Director Ian Johnson, explaining that even though the college has achieved LEED recognition for other buildings, this time it wanted to avoid the expense of becoming certified. "LEED doesn't guarantee any specific performance. It's more of a checklist. We followed the checklist, but we were more focused on what we want to get out of this building – the net-zero," he told reporter Bethany Alvarez. Recently, the building was recognized by the National Association of College and University Business Officers. NACUBO issued one of three 2017 Innovation Awards to Colorado College in recognition of its carbon-neutral, net-zero energy stance.